You may remember from last week that I shared a story I began developing years ago from a dream I’d had about a girl finding a ghost in a house. I decided that this week I would share with you my thoughts about that story and how it’s made me revisit some of my old work from years ago. 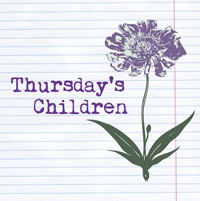 I was really inspired by so many comments on last week’s Thursday’s Children blog entry which were saying I should write the story – they’d love to read it. This galvanised me to hunt through the house for my original manuscript. Technically this consists of an old school exercise book and another larger notebook. I began reading what I’d started to write nearly twenty years ago as a 13 year old (I know how long ago it was because I’d dated it and yes I am that old!!). I haven’t finished reading it yet because there’s quite a lot of it. But I have to say I really enjoyed what I read. Of course some passages are a little bit teenage-girly but there are some great descriptions of my character’s feelings and of the house as well as her meeting the ghost. She’s a girl at secondary school (I think I made her about 14/15 so for those of you who don’t know the British education system I’m guessing high school) and she’s fallen out with her boyfriend. She goes off on her bike and finds this amazing house in the woods and eventually a ghost inside, a young man. I’d been working on it for a number of years. The most recent time was about 10 years ago, which I haven’t got to reading again yet but I’m keen to see how I continue the story on. Though I have to say I never finished writing it, having read all those lovely comments makes me feel I should seriously consider revisiting it. So how does all this relate to being inspired to write? Well for one thing it’s encouraging to me as I look back over my old work, and not just this, to remind myself of my writing style and how it’s developed over the years. It’s encouraged me, making me feel that yes I can write, I do have a talent and I should feel confident in myself that I can write a good story. Something I’ve noticed about my writing style from a while ago is that I wrote descriptive passages a lot more confidently when I was a teenager compared with nowadays, when I feel that dialogue flows from my mind onto the page (or more like computer screen!!) more easily than description. I’m hoping that rereading my old work – this story and others – will help me to revitalise my writing style a little and give me the confidence to experiment a bit with the way in which I tell a story. It’s a funny thing in a way to say that in a sense the younger me is inspiring the older me, but it’s true! What or who are your inspirations for writing? To join in or check out other wonderful writers talking about what inspires them to write click on this link. Thanks again to Rhiann Wynn-Nolet and Kristina Perez for hosting. Well, now I feel inspired. To the archives, Batman! That’s awesome! And yes, you should write it! For NaNoWriMo this last November, I worked on a story idea that I came up with 20 years ago. So yes, you should get back to writing that story! I think you might be right about descriptive passages and writing longhand. That’s how I used to do it some years ago but it’s been a while now since I took to typing my story straight into the computer. So much easier in many ways but I guess it’s possible to lose something from not writing longhand first. As a teen, I was a fan of reading historical romance. When I go back and look at the ‘novels’ (like 50 pages) I wrote at that time, I can see how I had the genre expectations and plot arc down perfectly. When I came back to writing with the intention of being published, it took me a few manuscripts to realize that it was a lack of those expectations which was partly responsible for me not getting an agent. I guess everyone who’s an author finds that their writing changes as they get older. I look at my old work and wish my writing still had that kind of energy and fervour. But then again a little maturity can help to bring more gravitas to what you’re writing. It would be nice to have a bit of both though. Yes! I’m glad you’re working on this ghost story. I’d like to read it. Thanks very much for the comment and the link. I’ll take a look. Have a good weekend. I love reading my old works. Sometimes I’m shocked at how good some of it actually is. I’m glad you found encouragement from yours!! Ha! Old work — as much as it makes me cringe — also reminds me how a lot of my writing is built on what I’d done before. Somehow, characters, speaking styles, and scenes seem to always be borrowed or inspired by stories I’d written before. Hey — it ain’t stealing if the original was yours, right? Exactly! I can get so much inspiration from my old work. Yay! I’m so glad you dug it up 😉 I went through a bunch of my old notebooks last time I was back in the States at my parents house. I found what I think was my first ever WIP. Basically it’s “Last of the Mohicans” set in Hawaii. Well, I was 12 and I had a big crush on Daniel Day-Lewis at the time! Yes it’s really interesting revisiting our old work. For me it’s like stepping back in time into my past life. Cool! I’m glad you’re going to work on it again. Because of this post I just went and dug out my creative writing folder from 11th grade. OMG! I’m laughing so hard. TERRIBLE! I may have to do a post on them? Great post Elaine – I love the idea of going back from time to time – just to remember what really caught your interest and evaluate your own journey. I’m so glad you’ve inspired yourself – I hope the rewrite goes well! Hi Raewyn. Yes it’s definitely a good idea to look at your old work. You can see how far you’ve come, how much your writing’s changed and what’s stayed the same. I think it can help improve your current work. Oooh do share sometime that sounds very interesting!